At Global Hospitals, we measure progress by the number of people in whom we restore the hope of healthy tomorrow. For us to do well, we know, we must help the world do well. Keenly focusing on quality, affordability and accessibility, we intend to establish performance benchmarks that cannot be surpassed. Global Hospitals has carved our a niche for it self in India's healthcare industry by excelling in area ranging from diagnosis to multi-organ transplantation, simple procedures to complex surgeries, international expertise to state -of-the art infrastructure. It is today a one stop healthcare destination for people across the country. I am proud of the utter dedication that's so much a part of all that Team Global Hospitals takes up. The Founder Dr K.Ravindranath, the architect of the global Hospitals' Group in India, traces his beginings to a non-descript and tiny village in Nellore district of Coastal Andhra Pradesh. Dedicated to excellence right from his schooldays, Dr.Ravindranath rose by dint of sheer self-effort to obtain MS from Madras Univercity FRCS from both Glasgow and Edinburgh. Dr Ravindranath was leading a quiet and happy life specializing in surgical gastroentrology and liver tranasplantation in Britain's prestigious hospitals when he had a call from his father,a freedom fighter. " A poor country like India needs your services more than a rich country like Britian" his aged parents counseled him.He did not waver for a minute in abandoning his lucrative job returning to India for good. Even as he asscoiated himself with liver transplants in Britain, he wondered why the procedure could not be done in India. Those were the days when the highly affluent, afflicted with terminal liver disease, made a beeline to beeline to Britain in the hope of undergoing liver transplantation. They spent a fortune and waited indefinitely in hostile climate for a doner liver. As Indians enjoyed the least priority in the allocation of donor organs, many of them died waiting while a fortunate few were allocated marginal livers. India has some of the best medical brains in the world. In fact, it is they who keep the medical services in the counties like the U.S.the U.K and in the west Asia ticking. India has some of the finest hospitals in the world in terms of infrastructure. Yet for liver transplants the patients had to go abroad. Dr Ravindranath was dreaming of opening a facility totally dedicated to liver transplantation in India when his father stirred up his latent partriotism and hastened his return. Dr Ravindranath returned to Indiain 1994 but he had to await the passage of the Human OrgansTransplantation Act before he could design and build Global Hospitals in Hyderabad as exclusive facility for multi organ transplants in 1998. Global Hospitals over the years has become a center of excellence not merely for organ transplantation but also for super speciality teritiary care. Spurred by the resounding success in Hyderabad, Dr Ravindranath has replicated Global Hospitals in Banglore and Chennai and is the process of replicating them in Mumbai, Delhi, Kolkata and Bhubneswar. 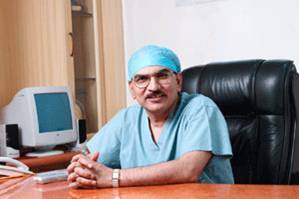 Dr Ravindranath is one of the few doctors in India who have metamorphosed themselves into successful entrepreneurs without bidding goodbye to their primary duty of saving lives by wielding the scalpel. That Global Hospitals, which came into existence in 1998 with a 50-bed single Speciality, has now grown into a titan with three major healthcare hubs and nine satelite facilities with a total bed strength of 1700 eloquently testifies to Dr. Ravindranath's vision, passion and dynamism. "I have miles to go before I can sleep," says Dr Ravindranath.